You will see both the beginning and the end of the war in Nuremberg. 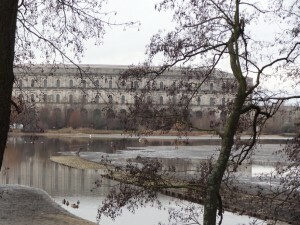 The beginning lies in the Dokumentationzentrum museum and Reichsparteitagsgelände in the south east, where the Nazi party rallies were held prior to the war. This is one of the places where the Second World War truly began – where the hatred was fomented, the crowds whipped into frenzy, where the poison was injected into the mass consciousness. In Triumph of the Will – the film that immortalised the 1934 rally, and one of the great examples of Nazi propaganda – an early scene depicts the shadow of Hitler’s plane flying over the rooftops of Nuremberg. The plane is low and there are human figures visible on the streets below, great columns of soldiers marching through the town. The cruciform shadow alights upon them briefly, in a twisted blessing as they march toward the as yet unseen destination of the Reichsparteitagsgelände. Here the Nazis could place themselves fully on show for the first time, having taken power the year before. Here Hitler could safely stand in the back of his open-topped car and receive the salutes, as the Jugend und Arbeiter und Soldaten marched past, in the few short years before he unleashed them on the world. How anyone witnessing this statement of intent could not have realised the path they were being led down, I do not know. Today the site is still intact and stands as testament against what sprung from that particular patch of earth. The Dokumentationzentrum itself chronicles the rise and fall of the Partei and the nation that spawned it. It is strange to look at the familiar images of the Nazi night parades, and to know that it is just outside this building that these pictures were shot, that just outside the endless lines of Aryan manhood paraded down the Grosse Strasse. Their footfalls are still so very audible, 80 years on. If any place is haunted, this is it. Not haunted in the same way as Auschwitz or Bergen-Belsen with the millions of emaciated, abused victims. Haunted rather with the mists and eddies of a warped philosophy which started here and radiated outward to infect the world. It is a little like the infection of Chernobyl – the closer one gets to the concrete wreckage of the exclusion zone, the greater the danger of the invisible radiation. But, to walk around the site itself is to realise that nothing lasts forever. The Grosse Strasse, a long, wide stretch of road that was used as a parade route has a carpark at one end. This appeals to me – the overlay of indifference, of disdain upon one of the great symbols of the Nazi machine – to simply cover it up with almost the ultimate icon of 21st century banality, a carpark. So this is your 1000-year Reich? But this feeling is tempered with one of affront, that such a great evil can be forgotten, can be bypassed. Should this nation not remember – be made to remember every day – what their parents and grandparents were responsible for, what was spawned here? Should they ever be allowed the luxury of forgetting? The end of the war – and an antidote to the insanity – lies across town, a couple of miles north west, in the Palace of Justice on Bärenschanzstrasse . In Courtroom 600, the Nuremberg Trials of the Nazi War Criminals took place almost immediately after the war ended, in November 1945. Walking into Courtroom 600 is a little like walking into a church. It is a place of quietude, a place of reverence. 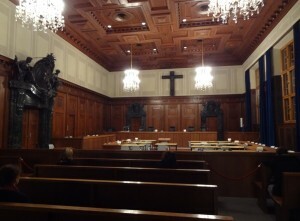 The room itself is very familiar, particularly the judges benches and the defendants section. Goering, Hess, Donitz, Raeder, Jodl, von Papen, Keitel, Streicher, von Ribbentrop, Speer. All of them sat here, in this room – answerable at last, terrifying in their resemblance to the rest of humanity, lines of white helmeted US Marines behind them. The world showed it’s superiority by allowing them this trial, rather than just lining them up against a wall and gunning them down. Instead, they could listen to translated evidence, they conversed with their lawyers, who acted according to legal precepts that had never been required before, and had only been constructed in the preceding months. They were allowed access to civility, to fairness, to the humanistic behaviour that they had so carefully designed out of their version of humanity. After all the death, the mayhem, after the reordered geography, after the destruction of cities and entire communities, this is where it ends, with the trials of the criminals that could be captured in time; and the subsequent judgments upon their underlings. The leaders finally held responsible for the decisions they made from their offices and HQs in the field, that led to the deaths of millions; the underlings finally held to account for the decisions they made face to face with their victims, that led to the deaths of individuals. It is this trial, this room, that formed the blueprint for future International Courts of Justice, that despite their fallibilities, are filled with good people attempting to set right the worst of our collective natures. It is right to stand in this room and give thanks to what happened here; it is right to pause and remember what they did, and those they did it to. It is here that Nuremberg begins to redeem itself.